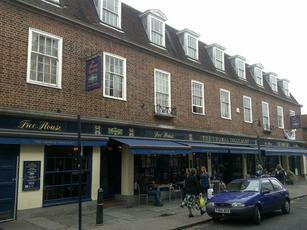 One of 2 Wetherspoons in Canterbury. It may be big. But service was extremely slow. Typical interior with the usual decent selection of ales - Ruddles Best, Greene King Abbot, Sharps Doom Bar, Hopdaemon Green Daemon & Incubus, Titanic Stout, Shepherd Neame Spitfire, Burton Bridge XL Bitter & Old Dairy Up and Under. The cider was Old Rosie. The place was packed with most people having lunch. This WSP is the bigger of the two in Canterbury. lot more staff = less waiting time. manager seems to have it organised. I had the fish and chips, ok.
Was here on a Wednesday afternoon, and the beer was good and the place comfortably busy. But thought I'd pop in again on a Thursday night, and it was heaving with students. No chance of getting served, so I was off.